Ashley and Kayte-Lee here again and we are back with a new graphics product launch! First we want to thank everyone who supported our first product launch Infographics IM Edition which got crowned "JVZoo Pick Of The Day" (November 12, 2013)... thank you, thank you, thank you! But we are not stopping here. Help us continue our streak with our latest product, Entrepreneur Vector Graphics - and we want to have YOU onboard! 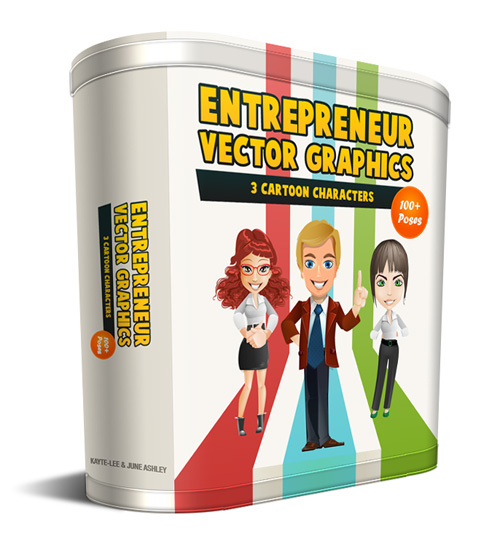 What Is Entrepreneur Vector Graphics? 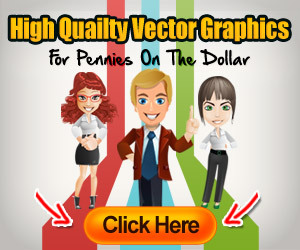 These are vector images of Entrepreneur cartoon figures that users can copy and paste to their sales letter, information products, product covers, keynote or powerpoint presentations, and in advertisements to enhance their image and impression. The package consist of 3 different Entrepreneur Characters with 100+ various poses, available in PNG format (with invisible background). The editable .ai version is available in the Developers License. If you hired graphic designers before, then you will know that they normally charge hundreds of dollars easily for custom graphics work like this. Of course, with our graphics package we won't charge anywhere near that. High Quality Package - the good thing about graphics is that seeing is believing, and you can judge for yourself :) I will also add that both Kayte and I design graphics for our clients since 2009. Your Subscribers Will Love You! They will be happy to know that we are going to release this package at a massive discount for the Christmas season! High Conversions - we are obsessed with tracking, tweaking and optimizing the conversions throughout the sales funnel so you can maximize your profits with every click you send. Low Refunds - you know the good thing about a good graphics product? It sells itself. Because seeing is believing. And that's not all . . .
Cash Prizes To Be Won! More on this below . . . STEP #1 - JOIN OUR JV NOTIFICATION LIST! First of all, join our mailing list here so you can get updates for this launch. Enter your details below, then check your Inbox for a welcome email. NOTE: You will also receive affiliate updates on our upcoming graphics package releases. You can choose to unsubscribe at any time; remember that we will NEVER, at any time, send you promotional email offers through this list. We are using JVZoo to process affiliate payments and tracking. You need to have an account with JVZoo first. Feel free to edit where needed. Include your affiliate link and signature before mailing out to your subscribers, customers and members list. Step 1. Download the PDF file here containing links to the bonuses. Step 2. 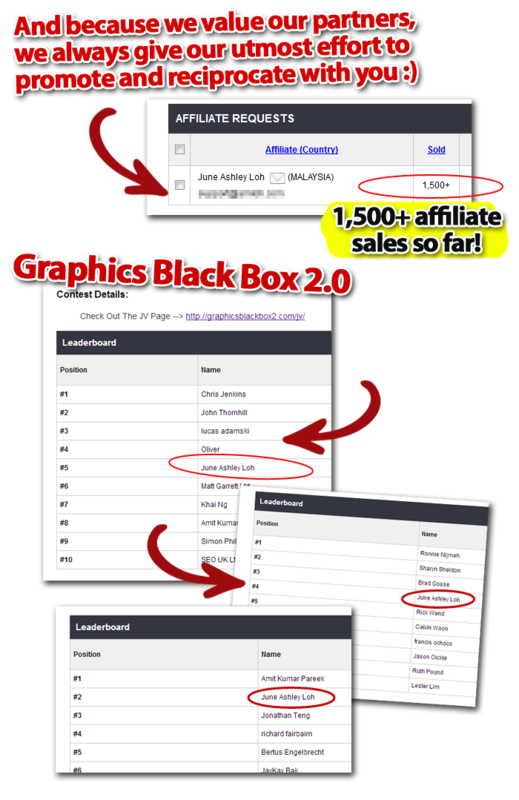 Log into your JVZoo account, then go to Affiliate > Affiliate Bonuses. Choose "Add New Bonus". Select "Entrepreneur Vector Graphics" and upload this PDF file as the bonus. Click SAVE. Now your bonus delivery is automated! There's a brand new vector graphics package just released by graphic designers June Ashley and Kayte-Lee. This is going to give your website, product covers and presentations a fresh new look - all within 'copy and paste' away! 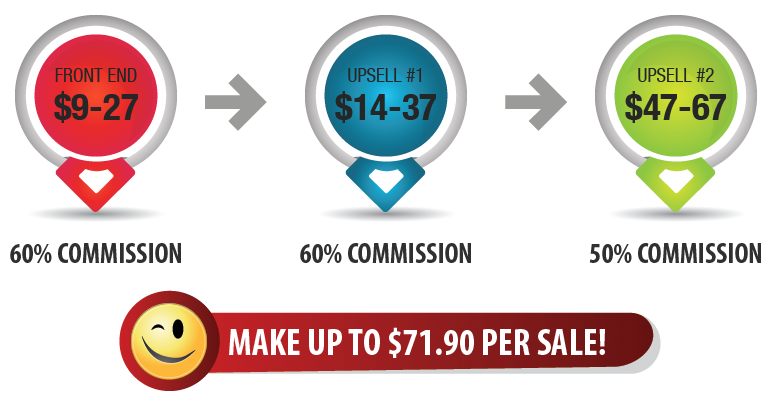 If you are selling or marketing anything online, then you know that you need to look the part if you want to become successful. You can't afford to 'dress sloppy' online and using illegal images scraped from other sites come under a legal penalty. 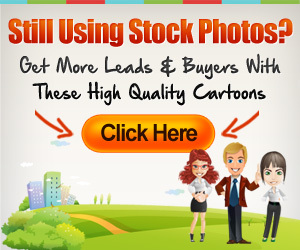 It's a shame people have to resort to that because buying the license to stock photos are not cheap - until now that is. Here you can get 100% ready to go cartoon characters featured in various poses - you don't need Photoshop... just copy and paste and you are all set! You can use these new images for anything from e-book covers all the way up to hard copy publishing like banners and buntings even! The beauty about vector images is that they won't pixelate or lose quality no matter how you scale and stretch them. That's Not All... if you decide to snap this up through my link today, you also qualify for these extra bonuses! Seals, boxes and shapes for easy editing and writing over. 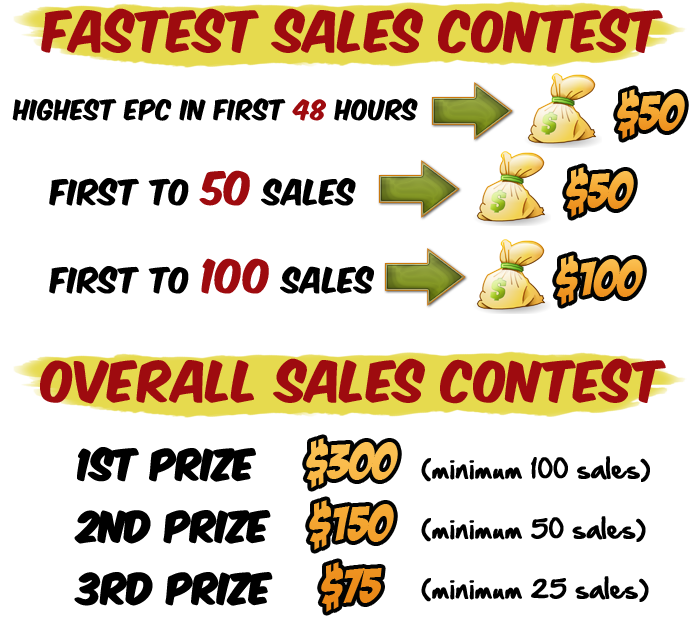 Easily make your own high converting banner ads with these templates. 10 website elements rolled into one power pack! Also comes with Resell Rights! 2. 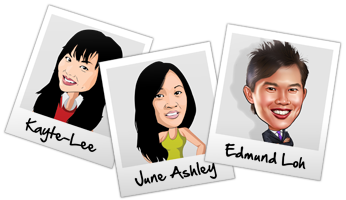 Vector graphics to enhance your website and covers! ... It won't cost you even near a fraction of what other people out there are paying for it! Graphic designers June Ashley and Kayte-Lee have created a series of cartoon characters with different poses and actions to suit every temperament of your business needs. Just so you know, vector images are one of the highly expensives types of graphics out there and to get one done can easily cost a few hundred dollars at the very least. And with good reason: the vector images do not lose their quality or pixelate no matter how you stretch or scale them. And much more with royalty-free usage! You don't need to have Photoshop or any graphic software to edit - just copy and paste and you're good to go! 2. 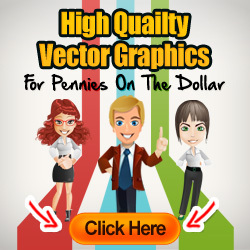 Get your brand new vector graphics for pennies on the dollar! Graphic designers June Ashley and Kayte-Lee have just released a brand new graphics package called "Entrepreneur Vector Graphics". 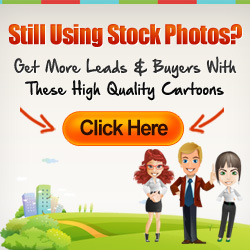 Are you fed up of the usual stock photos that you're used to seeing and using? It's time to give your websites, product covers, presentations, and marketing materials a fresh new look! In this vector graphics pack, you get 3 different cartoon characters featured in various poses to suit all marketing needs and occasions. You don't need to know or have Photoshop... just copy and paste any of these images and you're ready to go! But you won't find them charging you that - nowhere near that in fact. There is a catch though: since this is newly launched it's going at intro price. So the price goes up steadily with every few copies sold until it reaches the retail price or the intro price period is over - whichever one comes first! 2. Have you started using vector graphics yet? In case you happen to miss this out the other day, there is a brand new vector graphics just released. If you are selling or marketing anything online, this is going to help you boost your conversions, enhance your presentation and also your end user experience! Rather than telling you, why not see it for yourself? Make sure you use them to replace any graphics you might be using in your covers, themes, blog posts, products etc. that might be questionable or hurting your conversions! P.S. The price is still low last I checked but better hurry before the intro price expires! And if you have any blogs or websites, you can also include any of the following banners of your choice - be sure to replace [[AFFLINK]] with your actual affiliate link! Looking forward to send huge instant commissions your way! P.S. If you need to get in touch with us on this launch, email at ashley [at] graphicsling [dot] com or kaytelee [at] graphicsling [dot] com and we will be right with you!